Calphalon Your Set $500 Gift Card Giveaway! Back in January, I met with two representatives from Calphalon. We had lunch and they told me all about their cookware and their new program called "Your Set by Calphalon". It is really a neat concept. You start off by selecting either the AccuCore Stainless Steel or Unison Nonstick 5-piece set and then add the pieces you want to complete your set. You buy the additional pieces at a discount - the more you buy, the bigger the discount. You can get up to 40% off the additional pieces. I love this idea! The website is fun to play around on. Not only can you customize your set of cookware, you can browse and see what other people selected (Iron Chef Michael Symon built a set) and watch videos with some delicious recipes. The site is iPad friendly. I use my iPad in the kitchen all the time, so I love this! Calphalon gave me two sauté pans to check out. I received a 3-quart AccuCore Stainless Steel Sauté Pan and Cover and the 6-quart Unison Nonstick Sauté Pan and Cover. I loved them both. I tested out the AccuCore Stainless Steel Saute Pan first. The Calphalon AccuCore Stainless Steel pan is made from 5 individual metal layers with a copper core that heats evenly to help maintain a more consistent temperature across the entire pan. I decided to test this out with my recipe for Chicken in Lemon Butter Caper Sauce. I was really worried about pan searing the chicken in the stainless pan. My other stainless pan tends to stick. Well, the chicken didn't stick at all in the Calphalon AccuCore Stainless Steel Saute Pan! I was SO impressed, and relieved! The chicken crisped up nicely and dinner was a huge hit! The 6-quart Unison Nonstick Sauté Pan is huge, but surprisingly light. I love how roomy it is. It can easily accommodate cooking 4 chicken breasts at a time. The best part is that the nonstick surface sears meat without a lot of oil. I sautéed some chicken for dinner the other night and it turned out great. I can not wait to cook more with this pan! I think crab cakes and sautéed vegetables would work great in this pan. The best thing about both of these sauté pans is that they are dishwasher safe! Cooks great and dishwasher safe - can't beat that! I am giving you tons of chances to win! You can even get one extra entry per day by pinning recipes you want to try in your new set of cookware with the #YourSet tag. The contest ends on Friday, April 12, 2013 @ 11:59PM. The winner will be notified by email and has 48 hours to respond. If the winner does not respond within 48 hours, an alternate winner will be selected. Good Luck!! I'd saute some chicken breasts-those look great! I really like the Calphalon set we got as a wedding gift two years ago. I need a bigger pan to fry fish, although the Spicy Sausage Skillet looks good too. I'd definitely make a chicken and pasta dish, for sure! I have just one Calphalon pan and cannot bear the thought of losing it. Please help me add to my collection!! I would saute peppers and onions then add some chicken. YUm! I would make chicken fried steak, or smothered steak. I would love to win. That chicken looked amazing! It would be awesome to win these!! I would make a great fritatta! Would love a pan like that to grill chicken in! Prolly breakfast! Never cooked with stainless before, but I would love to. I would make some eggs or omlets. Would love a new pan like that! This is great! These are awesome pots and pans! Id make chicken in it. Yum! I think I would try out your chicken recipe here. Love capers! Love Calphalon! I would make something with chicken breasts that would show off a nice sear. I would love to win some new cookware! Thanks! I would make chicken parm! I would make something in the stainless steel pan that required de-glazing. I would make some crispy hash browns! The first thing I would make would be a chicken and broccoli stir fry! First thing I would make in one of those gorgeous skillets is Country Fried Steak with Milk Gravy! Yummm. The first thing I would make would either chicken Parmesan or breakfast dinner. I would make painted rooster. Chicken fajitas sound really good! A delicious fritatta! I don't currently have any pans that are oven-friendly. It would have to be steak especially to see if I get a good even sear on one. How exciting! I love Calphalon and would love to create my own set. I would make a spinach omelet! Yum. I'd use these pans for Hawaiian Hamburgers w/ sweet and sour sauce. I would probably make grilled cheese for my kids :). Interesting concept - I'd definitely make some stir fry noodles. Oh my gosh,I am so excited about this, I don't know what the first thing I would make but that is our brand !!!!!! I'd make bacon, for sure! I would try breakfast foods...eggs and hashbrowns. Would definitely be making pancakes & eggs for the first trial run. Probably eggs. It's my standard and they're sticky enough to where you can get a good idea of how to clean the pan! I have recipe for copycat Cracker Barrel chicken, I would definitely make that first! I'd love to win the nonstick set to add to my Calphalon collection. I'd make some Chicken and Dumplings. Yum! This is perfect timing, because I'm eyeballing a new stove soon, as well. I'm thinking I'd either try a steak or some salmon. Been craving both. I would love a non-stick pan to add to my collection! I love Calphalon! I'd definitely use it first for a orange chicken stir fry. So yummy! I would probably make an omelette or french toast. Does it matter, because I am sure they all would be tasty!! Chicken is my go to protein! I would definitely fix my copycat recipe of Cracker Barrel's grilled chicken tenders. 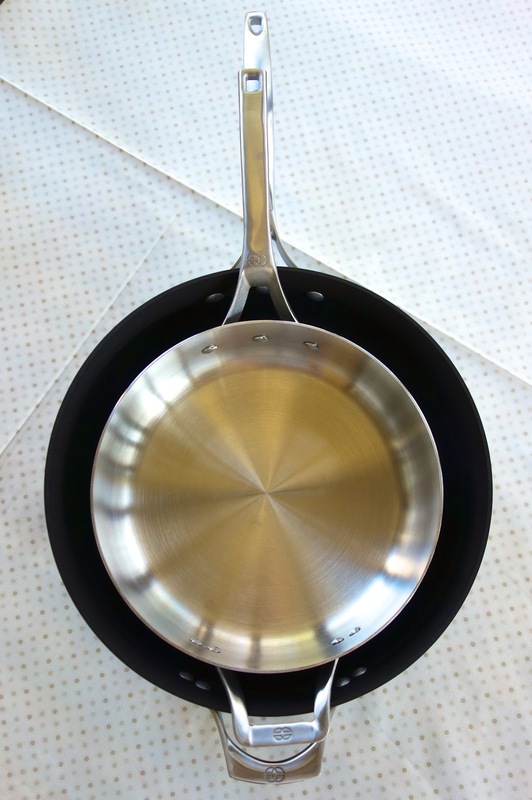 You have to have a large skillet and looks like the nonstick pan would be the perfect size. Oh my!! These pans sound so wonderful. I hear other cooks who have really nice pots and pans say how nice their food comes out. I'm thinking chicken fried steak! It always sticks in my pans. Plain ol chicken breasts, yumminess! I would use these pans to cook everything and anything in them. I love the few that I have and would love to add to them. The best thing about them, for me, is they can go in the oven. From browning/searing to the oven....less pans/dishes to wash the better! That chicken dish looks yummilicious! OH my goodness....there is an endless list of things I could make in one of these pans....tons of recipes from PlainChicken.com!! I would make mesquite lime chicken and oven risitto! I saw a recipe for ground chicken burgers with grilled pineapple and pepper jack cheese. I would love to make those! I'd fry some bacon and eggs, then try out on of your recipes for sure! Thanks for this chance to win a set of Calphalon! I have always wanted a set. And the first meal I would prepare would be "Liver & Onions". made this lemon caper chicken, it was amazing. Thanks for a chance to win. I would try your yummy Salmon recipe! I would make cilantro lime chicken breasts! I would make some grilled cheese sandwiches in one of the nonstick pans. I'd sautee some chicken, onions, and peppers for a stir fry first thing. I would love new pans to make jambalaya in! I would love to fry up some breaded pork chops in new cookware. Potatoes! I would adore one of those pans for some crunchy hashbrowns right about now! I definitely would use it for a skillet meal. One where I cook in it on the stove then transfer it to the oven. I would LOVE to win a set of Calphalon! I would try searing some nice steaks. Thanks for the chance to win! I love Calphalon - I don't have many pieces, but this would be an awesome way to grow my tiny collection and allow me to retire some pots nad pans I'm not so happy with. thanks for the opportunity! Would love to have some of their pans. Would definitely be trying a chicken in garlic and wine sauce recipe I am loving right now. ...ummm...well, with THESE tools THIS workman wouldn't be left with a good excuse for failure!! I'd love to try a steak in them since they sear so well. I would probably try the same thing you did except for some reason my family calls it "french chicken". I would definitely try searing and browning some kind of meat because mine always sticks so your comment about your chicken really makes me want to try again! Wow. What a nice giveaway! Thanks!!! I'd make FOOD! lol! I haven't a clue this early in the morning...but I would be one happy camper with these pans! I NEED new pans ! Mine are almost 30 years old! I would try out a omelet as that is a good test for a good pan. I think I would try pork chops in the Calphalon pan! Yum! Chicken Fajitas would be delish! I would make chicken fried steak! Never tried Calphalon but after reading your post, they look like a winner! I would make grilled cheese, yum! I am CRAVING a stirfry! I would make a salmon recipe for my husband! I would have to try your dish of course! I have tried several of your recipes and find them to be yummy! Love your blog and thank you for sharing this great giveaway! Gosh, i would probably make pork chops. Yummy pork chops. I'd make breakfast: eggs, bacon and pancakes. Our pans need replacing so it would be awesome if I'm the lucky winner!! I'd make scrambled eggs with butter & parmesan...I never knew eggs could be SO amazing until I re-watched Julia Child make them....what a difference! I would make chicken teriyaki! I would make a Ham, mushroom and cheese omelet. No sticky! Spaghetti Carbonara. It's my favorite pasta dish. This is a fantastic giveaway. I'd make yummy chicken tenders! i would make the lemon caper sauce chicken. I always have a hard time cooking chicken in a pan! I'm thinking some Schnitzel and a Warm German Potato Salad sound really good right now. Great giveaway! I would use these to make many chicken dishes! I would probably make a chicken stir fry! Cajun Chicken Alfredo for sure! recently purchased two Calphalon quart s. pan and am very impressed with the durability. I would love to have this set and what I'm most excited about is that they are dishwasher safe!!!!!! i would sear some salmon fillets! The chicken breasts look yummy...I would try that first. Thanks. What a yummy giveaway! I'd make fettucine alfredo in my new Calphalon! I'd make some Pork fried rice. Yum! I would love to make smothered chicken in these great pans! Thanks for a great give away Steph! I would make salmon patties!!! WOULD LOVE LOVE LOVE to win this giveaway!!! Thanks for the opportunity. I'd sauté some Greek green beans! Delicious! I would love to make some fish, just cooked with butter and not end up with a pile of mush that stuck to the pan! 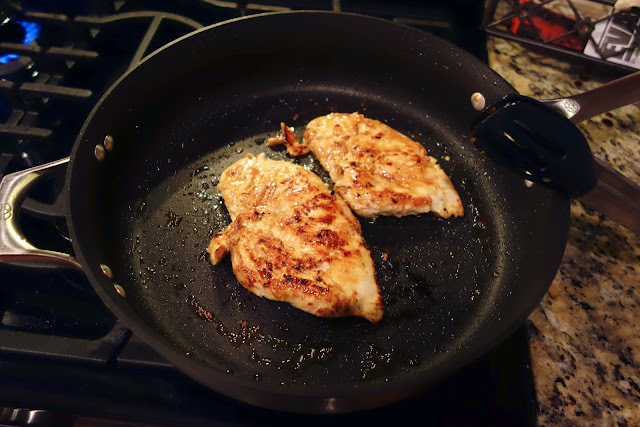 As simple as it is, I want to try searing chicken. I don't have any pans that work for this technique. I have no earthly idea. Until recently I survived on take-out and Lean Cuisines but I'm now trying to learn to cook so probably something straightforward and uncomplicated. My mom has Calphalon pans and I absolutely love them. I would love to have my own! I think I'll try that chicken too. It looks yummy! Either my son's fave breakfast, eggs and potatoes, (if he's still on that kick) or the egg for my breakfast sandwich. Fried pork chops with herbed butter.That is one of hubby's favorite dinners. 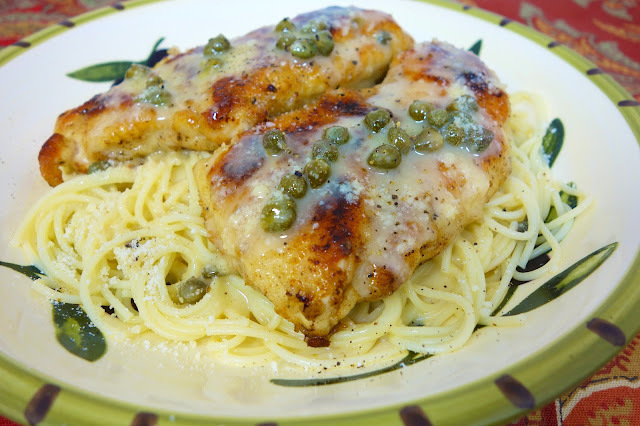 One of my husband's favorite dishes is Chicken Piccata, so I would try your recipe for Chicken in Lemon Butter Caper Sauce first! That looks right up his alley!! The first thing I would make in a new pan would be salmon for the husband and chicken for me! Probably some kind of stirfry. Yum! How nice these pans look. Grilled cheese for sure :). My pans are a pathetic mis-match of cheap knock-off's. I would LOVE, LOVE, LOVE to have some GOOD pans. The first thing I would make would be my families favorite sourdough pancakes. Oh my, Steph, that chicken dish you're showing looks amazing (love me some goooood chicken!) and I think I'd try it or a Milanese dish! I would make pan fried porkchops with dijon gravy! I would make some chicken and pasta. I am going to make a parmesan crusted grilled cheese sammie! I would make some french toast. We have 6 chickens so eggs! I would make skillet chicken parmesan! I would make some scallops or risotto or both! I just printed off your recipe for Lemon Chicken! Those look like awesome pans. The first thing I would cook is hash browns. I'm super picky and love mine crispy outside and softer inside. That is sometimes hard to do if the pan doesn't heat evenly so most times I'll end up with part of them nicely browned but another area barely brown. I'd love to test on these pans. The Calphalon Unison set is not a good deal. The pans are so sensitive to anything that's not soft plastic that it gets scraped and scratched easily, even using wooden spoons as was recommended to me. In less than three years, my Calphalon Unison pans already need to be replaced even though I have carefully followed all manufacturer recommendations and only handwash my pan. That being said, I haveheard good things about the other sets. I just think the coated ones are horrible. I love my one Caphalon pan I own. It would be great to build a set! I would make chicken or steak. Oh they are soo nice! I would love to win this giftcard so I could get myself, and my mom some new cookware! I'm a SAHM, so my pans get A LOT of use..and I cook anything I can in them...and if I've never cooked it before, you can be sure it's on my to-do list! I love the fact that the large saute pan has TWO handles - great for me since my wrist surgery!! I know I'd love being able to design my own set! I'd definitely make a chicken veg's and pasta dish! I love searing up pork chops! Stirfried brussels sprouts with bacon and onion. I think those babies would need a mess of catfish fried up in them! I would make a mutton vindaloo curry! Your chicken dish has me drooling and what an awesome give away. The chicken looks so pretty with the capers in the sauce.